The word team is often used to describe a group of two or more people who are working together. 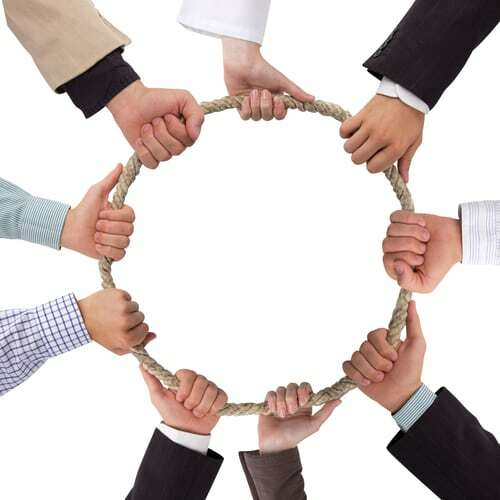 However, teamwork is about combined action – about coming together to achieve a common goal. When it comes to developing a group’s ability to operate as a team it is important to determine whether or not the people in that team have high or low degrees of interdependency. I worked individually with a number of senior executives in a large company who all worked within the same area of the business but whose work was not heavily dependent upon one another and hence the requirement for them to operate as a team was low. Yet the leader of this group complained that the ‘team’ didn’t operate as a team! If your efforts at producing teamwork are not being successful, it is worth looking at the interdependency factor. In some cases that interdependency will be obvious, in others it will need to be spelled out and in others it will be almost non-existent just because of the way the work within the business is structured. This Linked In article by Laszlo Bock at Google gives some good tips on teamwork but I think misses, or else assumes, this interdependency point – and this could be because they do a brilliant job of engaging people in the vision and strategy of the business. In our work with executive leadership teams we call the point of interdependence the ‘Axis of Accountability’ – that point or those points around which all members have something at stake and need to work together to produce.